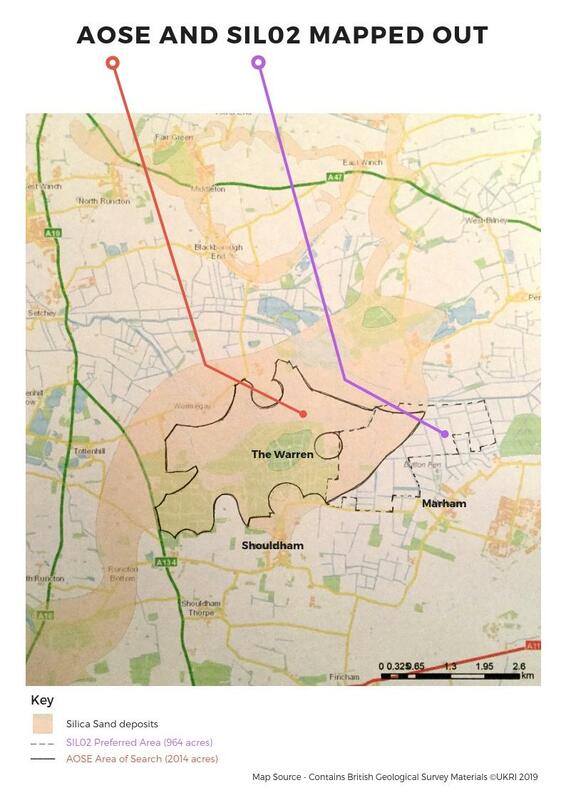 Sibelco have identified a 964-acre site in Marham Parish and a 2014-acre site in Shouldham Parish. It includes part of Forestry Commission site Shouldham Warren as an area of search for potential quarrying. If a quarry was to go ahead in this area it would be a devastating legacy for our children and their children, and would lead to a loss of ancient footpaths, endangered wildlife and have a massive impact on health and wellbeing. Norfolk County Council have now published a consultation into the proposals which has prompted comments from over 400 local residents. The authorities initial conclusion on the consulation is the site is considered suitable to identify as a 'Preferred Area', where a smaller specific site for Silica sand extraction could come forward in the future, subject to a planning application. Sibelco has given a potential start date of 2027 and estimated the extraction rate to be 800,000 to 900,000 tonnes per annum with the full mineral extraction resource at the site potentially extracted within 20 years. We do not plan for this to happen!